Giant cell tumor (GCT) of bone accounts for approximately 4%–5% of primary bone tumors and about 20% of benign bone tumors. It tends to occur more in females, in the epiphyseal region of long bones,, and generally occurs in the third to fourth decade of life. Common sites for occurrence include the distal femur, proximal tibia, distal radius, and the sacrum in descending order of frequency. GCT rarely occurs above the sacrum in the mobile spine; this location has been reported in approximately 2%–4% of cases.,, The incidence of cervical spine involvement ranges from 0.4% to1.0% of all GCTs as reported by Dahlin and Goldenberg et al. The authors report a rare case of GCT of the C2 body with a pathological fracture and atlantoaxial dislocation without neurological deficit along with its management and a 5-year follow-up. A 19-year-old female presented with sudden onset pain and restricted neck movements without any antecedent history of significant trauma. The pain was moderate in intensity, nonradiating, and aggravated by neck movements. There was no history of weakness in the limbs, nor any history of numbness in the extremities. Examination of the cervical spine revealed tenderness in the region of upper cervical spine and severely restricted range of movements. 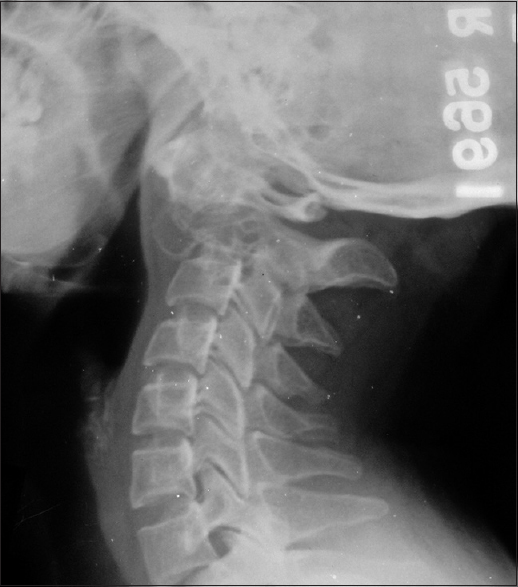 Plain radiographs revealed a fracture through the odontoid process of C2 with atlantoaxial dislocation [Figure 1]. Magnetic resonance imaging (MRI) study revealed an expansile lytic lesion involving the C2 causing destruction of the C2 body and dens. The lesion was reported to be isointense on T1 and hypointense on T2-weighted images with a corticated margin and causing indentation of the anterior surface of the spinal cord [Figure 2] and [Figure 3] and was suggestive of GCT or a chordoma. 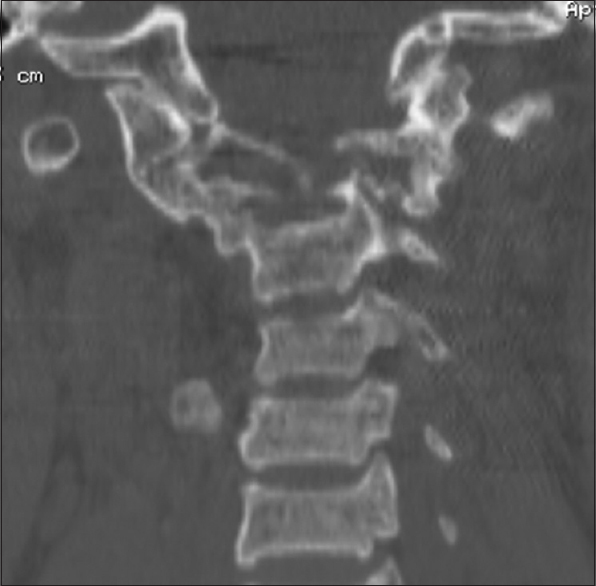 A computed tomography (CT) scan also confirmed the fracture through the base of the odontoid and a defect in the C2 vertebral body [Figure 4]. The hemogram revealed a normal hemoglobin, white cell count, and erythrocyte sedimentation rate. General body examination and a chest radiograph were obtained to rule out multicentric disease and pulmonary metastasis. The patient underwent a two-staged surgical treatment. In the first stage, no attempt was made to approach the lesion. A posterior occipitocervical instrumentation and stabilization was done using a contoured Hartshill rectangle and sublaminar wires. 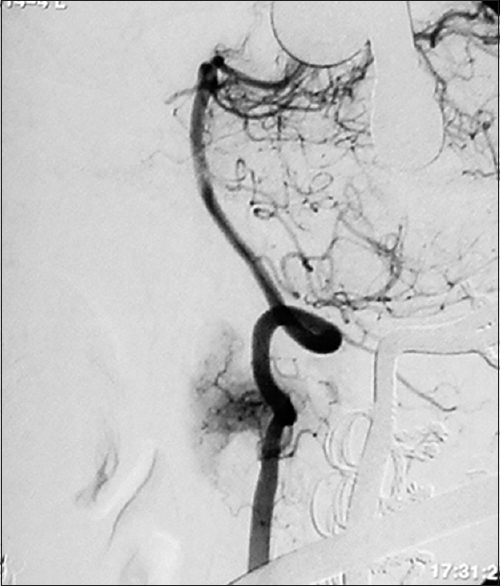 One month following the first surgery, the patient underwent digital subtraction angiography-aided tumor embolization to minimize intraoperative bleeding and to allow for a dry surgical field to carry out optimum tumor resection [Figure 5]. The next day, the second-stage surgery was performed involving resection of the tumor mass and curettage of the tumor cavity with the use of a high-speed burr through an anterior transoral approach. Reddish brown tumor material was curetted out. An intraoperative frozen section study of the retrieved tumor tissue was performed and was reported as GCT. Histopathology of the tissue sample obtained intraoperatively also confirmed the diagnosis of GCT. The residual tumor cavity was then carefully packed with autologous corticocancellous bone grafts. Postoperatively, the patient was maintained on a Sterno-Occipital-Mandibular Immobilizer brace for a period of 3 months. The patient was followed up initially every 3 monthly for the 1st year postsurgery and then subsequently annually. At a 5-year follow-up [Figure 6], a CT scan was obtained which revealed consolidation of the bone graft with a formation of a C1-C2 fusion mass [Figure 7] and [Figure 8]. There was no clinical or radiological evidence of recurrence at this stage, and the patient had a good functional outcome without any neurological impairment. 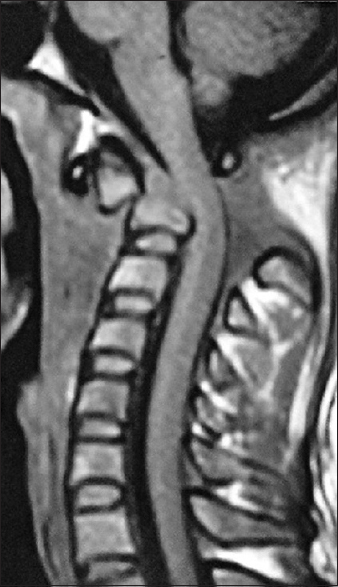 GCTs of the cervical spine are relatively rare. In a review of 10 cases of spinal GCTs, Kwon et al. reported MRI findings that are highly suggestive of spinal GCTs. These include findings of an expansile mass with heterogeneous low-to-intermediate signal intensity on T2-weighted images, curvilinear areas of low signal intensity on T1- and T2-weighted images, and cystic changes within the mass. Some of these findings were also seen in our case. Current treatment modalities for long bone GCTs include curettage and use of adjuncts such as phenol, bone cement, cryotherapy with liquid nitrogen, and bone grafting. However, GCTs arising in the spine, due to their precarious location in relation to nearby neurological structures, seldom can be treated by such means of extended curettage. En bloc surgical excision, wherever possible, appears to be the treatment of choice for spinal GCTs unless significant postoperative morbidity is expected. 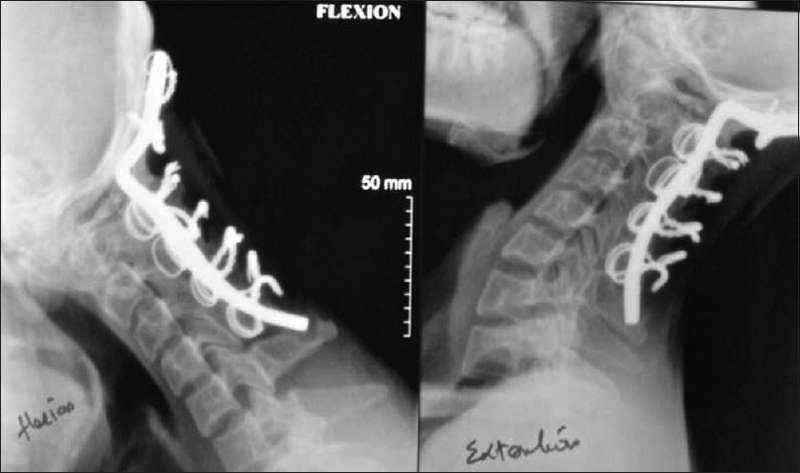 However, unlike in the thoracic and lumbar spine, a strict en bloc resection in the cervical spine is often not feasible due to the presence of various surrounding vital structures and risk of neurological deficit. We used a customized approach for our patient which addressed the instability first and then curettage with bone grafting for the C2 body GCT being the second stage. The role of radiotherapy as primary or adjunct treatment is still controversial. Despite the relatively high risk of radiation-induced sarcomatous degeneration of benign tumors, it is still used by many in cases where surgical resection is deemed inadequate or where surgical accessibility to the tumor is a major issue.,, The estimated frequency of malignant GCTs or a malignant transformation in benign GCTs is reported to be around 10%. In most cases, the malignant transformation develops after irradiation. In our case, postoperative radiotherapy was not administered due to the fear of radiation-induced neurological damage to the spinal cord. Now, most published series document recurrence rates of 5% to 15% for GCTs across all locations. Recently, Martin and McCarthy in their series of 23 cases of GCTs of the sacrum and spine have reported a recurrence rate of 22% for sacral and 31% for spinal GCTs. 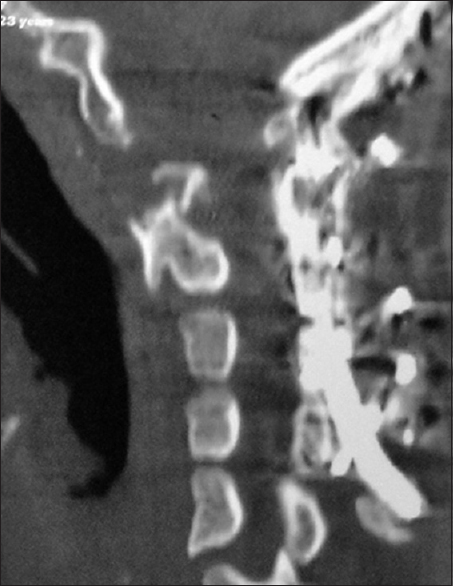 In yet another series of 24 patients of GCTs of the spine treated at the Mayo Clinic, Sanjay et al. published a recurrence rate of 41.7%. The higher recurrence rates in spinal GCTs as compared to other locations most likely seem to be a reflection of inadequate primary resection of the tumor. 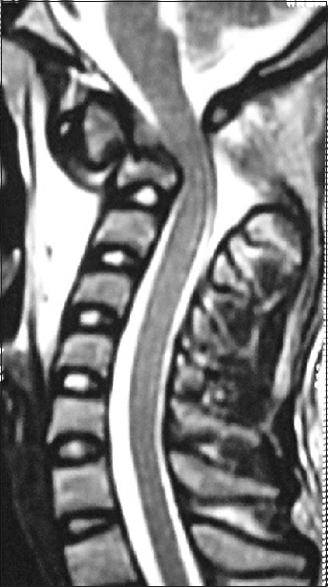 The rates of neurological impairment in GCTs of the spine, either at the time of diagnosis or following therapy are reportedly in the range of 50%–70%., In our case, the patient was fortunate to not have any neurological impairment despite an initial atlantoaxial dislocation resulting from a pathological fracture through the C2 body tumor. Selective serial arterial embolization (SAE) as a treatment option for GCTs of the sacrum was described by Lin et al. in 2002. The authors treated 18 patients with GCT of the sacrum with SAE as the standalone modality. Approximately 50% of the patients in their series showed a durable radiographic response at long-term follow-up. Hosalkar et al. also reported good results with this technique in their series of nine patients with sacral GCTs. Newer treatment modalities for GCTs include denosumab, a monoclonal antibody against RANKL. Thomas et al. in an open-label, Phase 2 study on the use of denosumab in GCTs reported a favorable tumor response in 86% of the patients in his study group. GCTs of the spine, compared to those arising from the long bones, warrant a more focused approach toward diagnosis and individualization of surgical as well as adjunct treatment modalities. Gamberi G, Serra M, Ragazzini P, Magagnoli G, Pazzaglia L, Ponticelli F, et al. Identification of markers of possible prognostic value in 57 giant cell tumors of bone. Oncol Rep 2003;10:351-6. Werner M. Giant cell tumour of bone: Morphological, biological and histogenetical aspects. Int Orthop 2006;30:484-9. Dickson BC, Li SQ, Wunder JS, Ferguson PC, Eslami B, Werier JA, et al. Giant cell tumor of bone express p63. Mod Pathol 2008;21:369-75. Mendenhall WM, Zlotecki RA, Scarborough MT, Gibbs CP, Mendenhall NP. Giant cell tumor of bone. Am J Clin Oncol 2006;29:96-9. Stoker DJ. Bone tumours (1): General characteristics benign lesions. In: Grainger RG, Allison DJ, editors. Diagnostic Radiology: A Textbook of Medical Imaging. 3rd ed. New York: Churchill Livingston; 1997. p. 629-1660. Campanacci M, Baldini N, Boriani S, Sudanese A. Giant-cell tumor of bone. J Bone Joint Surg Am 1987;69:106-14. McDonald DJ, Sim FH, McLeod RA, Dahlin DC. Giant-cell tumor of bone. J Bone Joint Surg Am 1986;68:235-42. Sung HW, Kuo DP, Shu WP, Chai YB, Liu CC, Li SM, et al. Giant-cell tumor of bone: Analysis of two hundred and eight cases in Chinese patients. J Bone Joint Surg Am 1982;64:755-61. Dahlin DC. Giant-cell tumor of vertebrae above the sacrum: A review of 31 cases. Cancer 1977;39:1350-6. Goldenberg RR, Campbell CJ, Bonfiglio M. Giant-cell tumor of bone. An analysis of two hundred and eighteen cases. J Bone Joint Surg Am 1970;52:619-64. Kwon JW, Chung HW, Cho EY, Hong SH, Choi SH, Yoon YC, et al. MRI findings of giant cell tumors of the spine. AJR Am J Roentgenol 2007;189:246-50. Martin C, McCarthy EF. Giant cell tumor of the sacrum and spine: Series of 23 cases and a review of the literature. Iowa Orthop J 2010;30:69-75. Junming M, Cheng Y, Dong C, Jianru X, Xinghai Y, Quan H, et al. 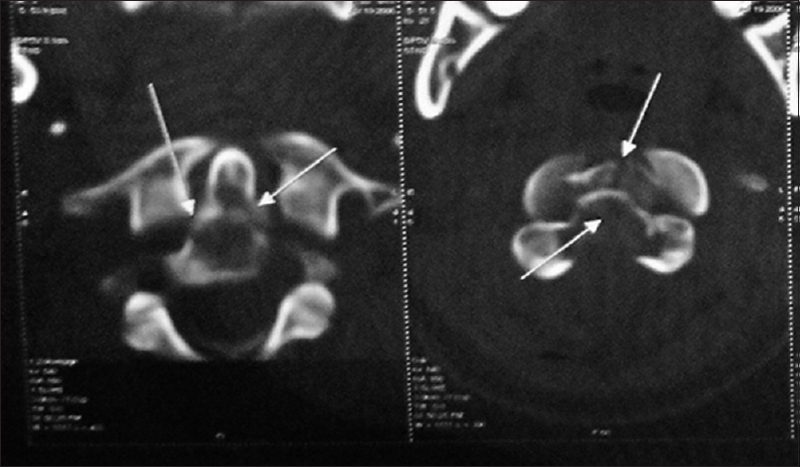 Giant cell tumor of the cervical spine: A series of 22 cases and outcomes. Spine (Phila Pa 1976) 2008;33:280-8. Sanerkin NG. Malignancy, aggressiveness, and recurrence in giant cell tumor of bone. Cancer 1980;46:1641-9. Rock MG, Sim FH, Unni KK, Witrak GA, Frassica FJ, Schray MF, et al. Secondary malignant giant-cell tumor of bone. Clinicopathological assessment of nineteen patients. J Bone Joint Surg Am 1986;68:1073-9. Turcotte RE, Sim FH, Unni KK. Giant cell tumor of the sacrum. Clin Orthop Relat Res 1993;(291):215-21. Seider MJ, Rich TA, Ayala AG, Murray JA. Giant cell tumors of bone: Treatment with radiation therapy. Radiology 1986;161:537-40. Heck RK Jr. Benign/Aggressive tumors of bone. In: Canale ST, Beaty JH, editors. Campbell's Operative Orthopaedics. 11th ed. Philadelphia: Mosby; 2007. p. 883-6. Sanjay BK, Frassica FJ, Frassica DA, Unni KK, McLeod RA, Sim FH, et al. Treatment of giant-cell tumor of the pelvis. J Bone Joint Surg Am 1993;75:1466-75. Lin PP, Guzel VB, Moura MF, Wallace S, Benjamin RS, Weber KL, et al. Long-term follow-up of patients with giant cell tumor of the sacrum treated with selective arterial embolization. Cancer 2002;95:1317-25. Hosalkar HS, Jones KJ, King JJ, Lackman RD. Serial arterial embolization for large sacral giant-cell tumors: Mid- to long-term results. Spine (Phila Pa 1976) 2007;32:1107-15. Thomas D, Henshaw R, Skubitz K, Chawla S, Staddon A, Blay JY, et al. Denosumab in patients with giant-cell tumour of bone: An open-label, phase 2 study. Lancet Oncol 2010;11:275-80.